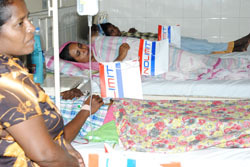 More than 15,000 tuberculosis (TB) patients have been recorded in the country in the past year, according to Consultant and Chest Physician of the Polonnaruwa Hospital Dr. Nandika Harischandra. He noted that a large number of TB patients do not opt to receive treatment, thereby endangering their own lives and creating health hazards for others as well. TB is a communicable disease similar to HIV that has caused a large number of deaths in the world especially in developing countries. The World Health Organization continues to consider Sri Lanka a country where TB is yet to be eradicated.